The personal information of U.S. women's national team players was temporarily exposed in U.S. Soccer's lawsuit against those players' union this week. The home addresses and personal email accounts of 28 national team players were made public among exhibits accompanying the lawsuit, which was filed in federal court in Chicago on Wednesday. The U.S. Soccer Federation is suing the players' union to "confirm the existence" of a collective bargaining agreement and head off a potential strike ahead of this summer's Olympics. The document had been posted on the court's website on Wednesday but was removed as of Thursday morning and later replaced with a redacted version. Midfielder Megan Rapinoe told The New York Times the players were upset to learn of the breach, as they came together to prepare for next week's Olympic qualifiers. 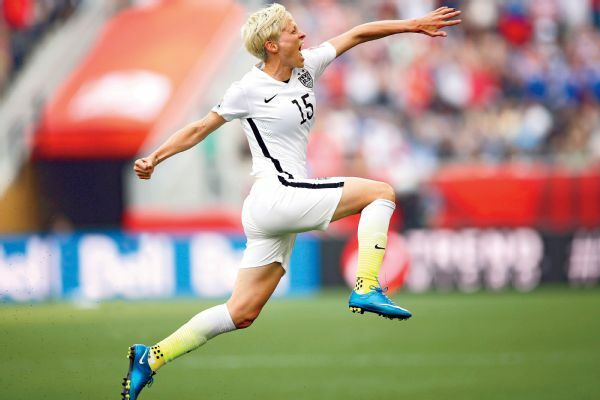 Megan Rapinoe, who hasn't played in a game for the United States since tearing the ACL in her right knee in December, was selected to the roster for the Rio Olympics. "Naturally we're upset," Rapinoe said. "The players are very, very upset. We feel disrespected. We feel that our personal information, our privacy and our safety was handled frivolously and with real negligence. I doubt it was purposeful, but it's an egregious error and one that's unacceptable. "We're public figures. There have been issues of privacy and hacking and stalkers -- it's very unsettling. We're upset. To know that someone could show up at your door? That's extremely unsettling, and it's something that you can't get back." The Times said the players' union -- the United States Women's National Soccer Team Players Association -- asked for the data to be removed, and U.S. Soccer apologized for the apparent mistake. The union's executive director, Richard Nichols, told The Times: "This morning in an email from me to their general counsel, on behalf of the players, all of whom are very upset about the public disclosure of their private information, we expressed our deep disappointment and outrage that players' personal email addresses and other private information was not redacted. "They subsequently responded with an apology and commitment to immediately retract and redact the exhibits to delete players' private information." In a statement to the Times, U.S. Soccer said it had replaced the revealing documents. "It was unintentional on the part of U.S. Soccer's counsel, and a redacted version of the complaint has already been filed," the federation said.